Iguazu Falls (or Iguaçu Falls) are located on the border between Brazil and Argentina and are one of the most amazing natural wonders in the world. 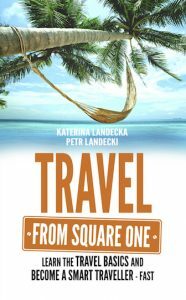 But, because of their location, they seem to be far from everywhere so some travellers skip them while in South America. 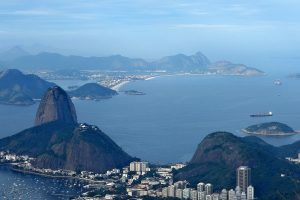 On our trip to Brazil, we were based in Rio de Janeiro and our holiday time was limited, so we were considering if Iguazu Falls were worth the detour and cutting our time in Rio. In the end, we decided to go because we didn’t plan to return to South America any time soon and ‘someday’ could easily turn into ‘never’. Also, we really wanted to see all those rainbows created by the mist of the waterfalls, the photos looked stunning. 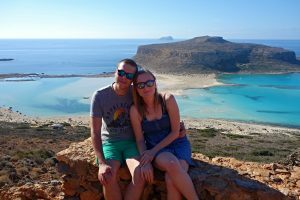 It was one of the most incredible places we have ever seen and we loved exploring the area – it really was a once-in-a-lifetime experience. 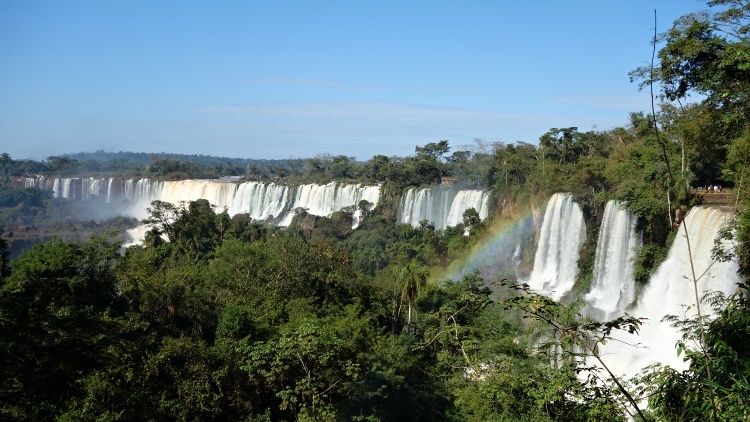 This is our overview of Iguazu Falls for first-time visitors so that you can make the most of your trip. Iguazu Falls are the greatest system of waterfalls in the world and are listed as a UNESCO World Heritage site, they are also one of the New Seven Wonders of Nature. 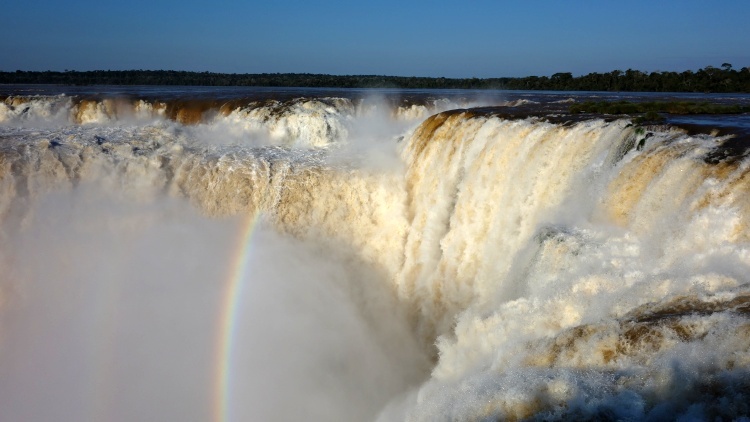 The number of waterfalls varies from 150 to 300, it depends on the actual water level in the Iguazu River. 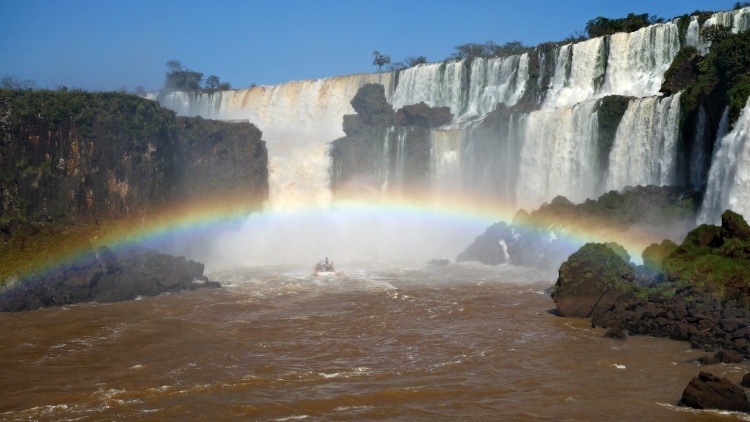 Almost 80 per cent of the falls are located in Argentina with the remaining 20 per cent in Brazil, which makes trip logistics a little complicated – you need to consider different country entry requirements (you will be crossing the border), currencies and languages. The highlight is definitely the impressive chasm Devil’s Throat (Garganta del Diablo) where the trails on both sides end – watching the tonnes of water falling down really is a cherry on the top. 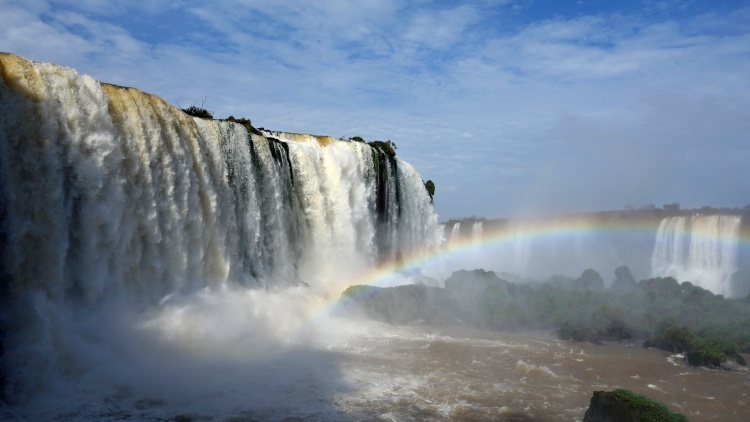 Iguazu Falls are a year-round destination and each season has its pros and cons. Summer (December to February) is wet, hot and crowded, access to some trails and islands might be closed, but the waterfalls are at their most impressive. Winter (July to September) is dry, cooler and less busy but there might be a low level of water in the falls. 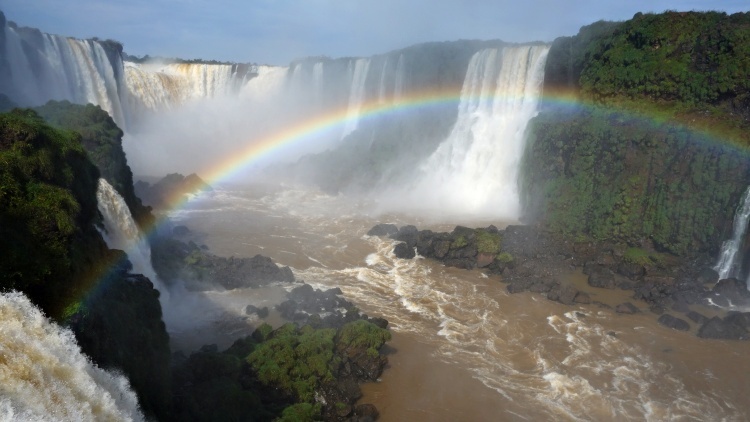 Iguazu Falls are a very popular place so try not to visit during weekends and public holidays to avoid the crowds. We were there in June and the weather was fine – it was warm and humid but still pleasant, the falls were full of water and all the trails were open. Foz do Iguaçu International Airport (IGU) is located near the entrance of Iguaçu National Park and is 17 km (11 miles) from Foz do Iguaçu – the main town on the Brazilian side. You can find the public bus, shuttles and taxis outside the terminal building, it takes about 30 minutes to get to Foz do Iguaçu. There is bus service from Foz do Iguaçu to the Iguaçu National Park. Navigation on the Brazilian side is straight forward – you only need to follow the bank of the river and explore the lookout points on the way, it’s an easy walk. The bus will bring you from the entrance closer to the Falls and at the end of the trail, it will take you back to the entrance. The Brazilian side of Iguazu Falls is much smaller than the one in Argentina but you will get a better overview of the Falls here, expect to spend half a day here. The crowds seem to be larger here because the area is more compact. 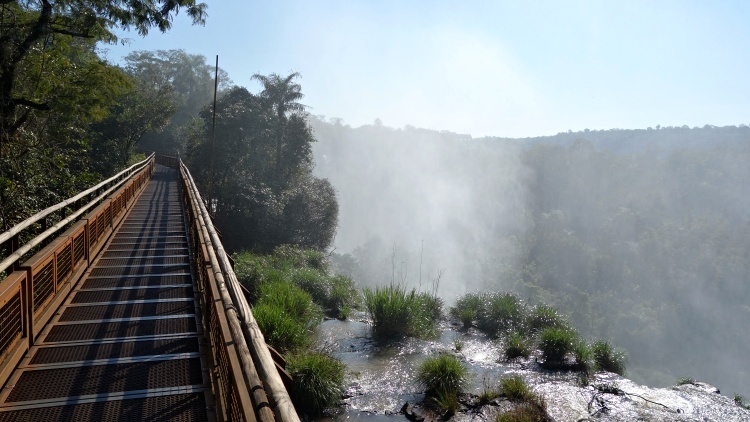 On the Brazilian side, you will get the views of the Falls from ground level, you can see the whole of Devil’s Throat from the platform close by. 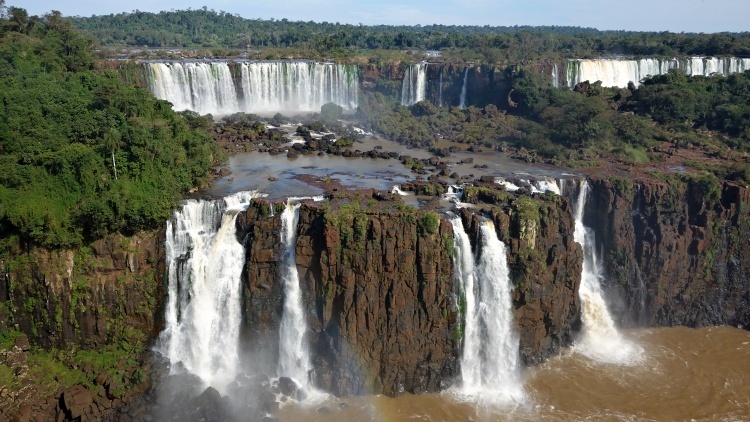 We recommend exploring Iguazu Falls in the morning and spending the afternoon in the nearby Parque das Aves, which is the largest Bird Park in Latin America. 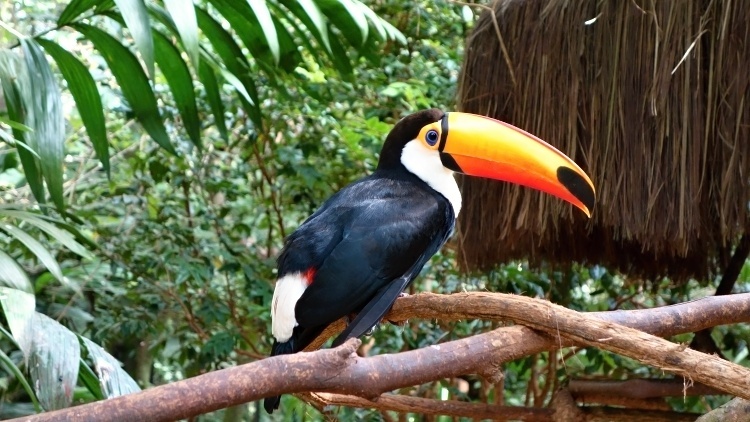 You can find many types of birds here – the colourful toucans and macaws are incredible. 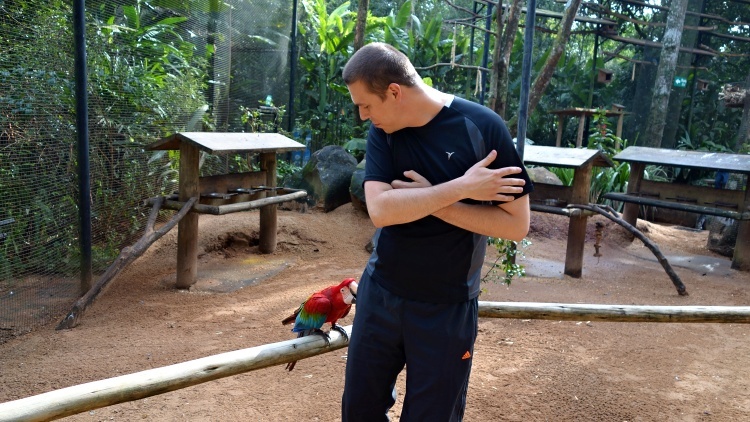 The trail leads through the lush rainforest, you can walk into some of the aviaries and get very close to the animals. 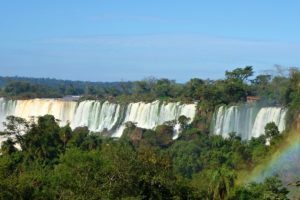 The town of Foz do Iguaçu is your best option when staying on the Brazilian side of the border, there are many accommodation options suiting any budget. We chose the Best Western Taroba Hotel for its great location – it’s close to the bus station from where you can get to the airport and both sides of Iguazu Falls. TIP: Drop into Churrascaria do Gaucho (Avenida Republica Argentina), a typical Brazilian BBQ restaurant around the corner from the Taroba Hotel, for a great value meal – it’s heaven for meat lovers! You might consider staying with local hosts in Airbnb (you can get free credit here). You can also stay in the National Park itself – when staying in the Hotel Belmond das Cataratas you will get unlimited access to the Falls, but it comes with high rates. Cataratas del Iguazu International Airport (IGR) is situated 10 km (6 miles) from the entrance of the Iguazu National Park and it takes about 15 minutes by taxi. The main town on the Argentinian side is Puerto Iguazu – the distance from the airport is 20 km (12 miles) and it’s about 25 minutes by taxi. There are no public buses available at the airport but you can take a shuttle, taxi or rent a car. Public buses run between Puerto Iguazu and Iguazu Falls, look for the buses with the sign ‘Cataratas‘. There are three train stations in the Iguazu National Park: Central, Cataratas and Garganta Station. The Central Train Station is a 10-minute walk from the Park entrance and you can board the Rainforest Train here. 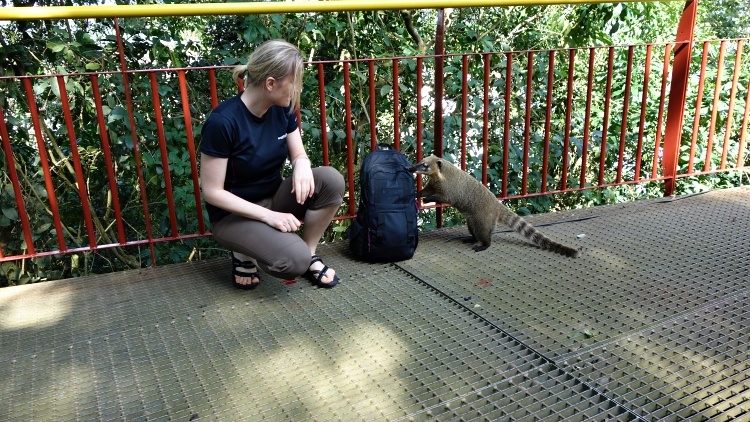 You can also choose to walk from the Central to the Cataratas Station instead of taking the train – it’s an easy 20-minute walk where you can even meet some coatis and monkeys if you are lucky. The Garganta Station can only be reached by train as there is no trail there. The queues for the trains can get very long so allow plenty of time not to miss the Devil’s Throat. We had to queue a lot and it wasn’t even the peak season, we can only imagine how bad it can get in the high season. 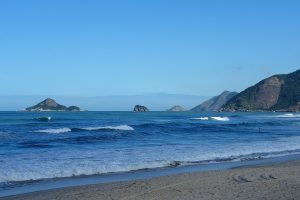 The area is spread out which means more walking than on the Brazilian side – expect to spend at least one full day here. On the Argentinian side, you will get closer to the Falls so be prepared to get wet, especially at Devil’s Throat, which you will be able to see from the platform above. We were pleasantly surprised by the number of butterflies, there were loads of them here and they were beautiful. We enjoyed the Lower, Upper and Devil’s Throat Walks but we didn’t manage to walk the Macuco Trail because we didn’t have enough time. Till next time, then! You can stay either in the town of Puerto Iguazu or in the National Park. 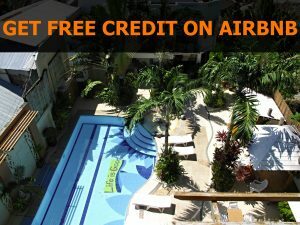 There is a good selection of accommodation in Puerto Iguazu, you can also check Airbnb (get free credit here). The Grand Melia Iguazu Hotel is located in the National Park close to the Falls but the prime location comes with higher prices. Boat rides to the falls are a must-do! We strongly recommend joining some of the boat rides – it’s such an unforgettable experience! They are offered on both sides and the boats will take you very close to some of the falls. We took one of the boats to the San Martin Waterfall on the Argentinian side and it was amazing – the amount of water going down was unbelievable. There were moments when it was hard to breathe because of all the water around us and of course, we got totally soaked. So much fun! If you prefer to stay dry, you might consider flying over the Brazilian Falls in a helicopter – unfortunately, we didn’t try it so we can’t give any advice on that. Watch out for coatis who look cute but they are very cheeky. They live on both sides of Iguazu Falls with most of them at the restaurant at the end of the trail in Brazil. We didn’t enjoy our meal in the restaurant at all, they kept jumping on our table trying to get some food and they got even more intense when Petr tried to open his backpack to get some stuff. Keep your bags closed and watch your belongings all the time because they are skilful thieves – they even get organised to distract you to get what they want, especially if it’s something that they can eat. Also, keep an eye on your belongings (and pockets) while in some of the aviaries in Parque das Aves, most birds are shy but macaws are not. Expect to get wet at some lookout points near the falls so quick-drying clothing, swimwear and a towel are a good idea, don’t forget to protect your camera or other equipment. You will be walking a lot so bring comfortable shoes. Repellent, sunscreen, sunglasses and hat will be handy too, we felt that there were more insects on the Brazilian side. 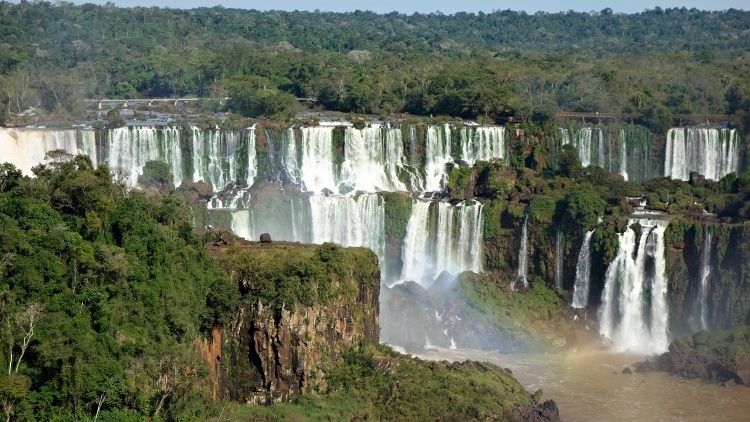 Iguazu Falls are a natural site so the refreshment options are limited and expensive – bring your own food and water. It’s not really possible to say which side of Iguazu Falls is better because they are both different and offer views from different perspectives. 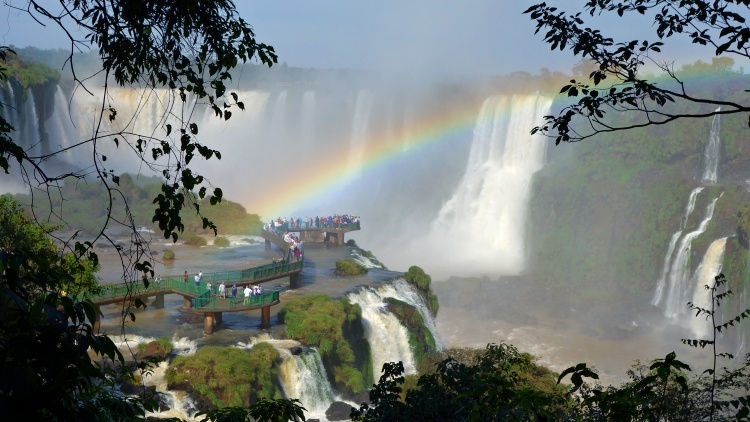 Iguazu Falls are a one-of-a-kind destination and once you’ve travelled that far you should definitely see both sides of the Falls – allow at least two full days for the visit. 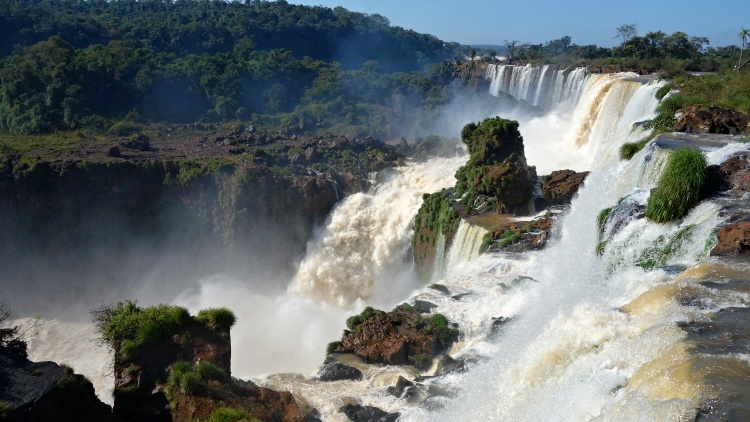 If you have more time, you can visit the Triple Frontier Landmark where Argentina, Brazil and Paraguay meet or the Itapacu Dam on the river Parana on the border of Brazil and Paraguay. 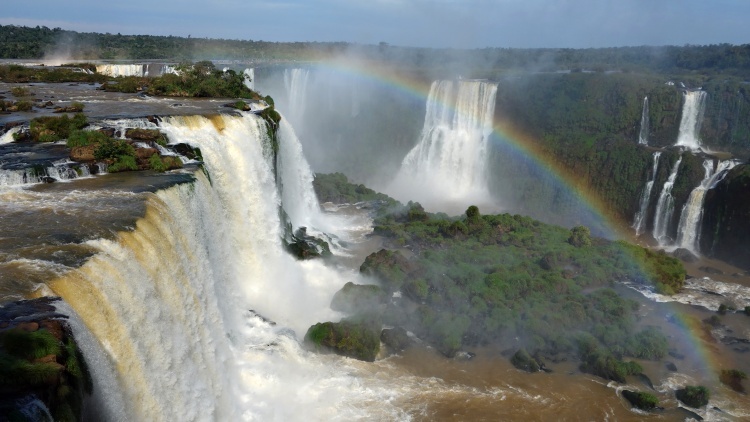 Iguazu Falls are a very special place so make sure to include them on your next trip to South America. Did you like the post? Please share it, so more people can find it useful.